Charlotte Colmant and Alessio Bordoni in Bliss. Photo by Steven Pisano. BOTTOM LINE: Bliss succeeds more in elevating the mind than engaging emotion. Bliss guides its audience through a transition from death to rebirth, as explained by the Bardo Thodol, or as translated by an English scholar in 1927, The Tibetan Book of the Dead. The double cultural origins of this performance are lightly explored through symbol and reference, engaging the mind as the body and spirit are taken on a relaxing aesthetic journey. The steady stream of translated text, adapted and delivered chant-like by Alessio Bordoni, does not lead the production, creating a “total theatre” experience. One feels that they’re intended to abandon the words and simply absorb everything that comes. Charlotte Colmant’s dance is always energetically full and beautiful, occasionally referencing the artwork on the scrim that separates the performers from the audience. 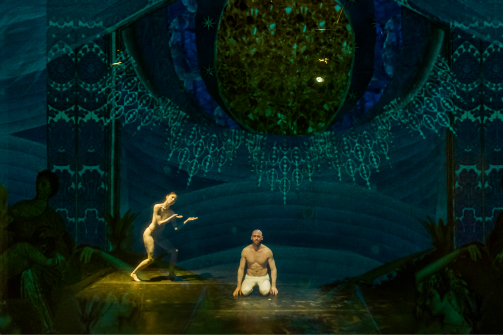 The lighting changes color to complement the visual projections, or whitens to dramatic effect on the performers’ bodies, but is essentially sculptural. The constant, gentle stream of music—Tibetan in inspiration, sparsely orchestrated by Amaury Groc with little melody—punctuates the action by adding a bell tree or the swell of strings at a notable moment. All individual design elements sink pleasantly into the inexorable, meditative flow of the piece. Yet the authority of this flow is questioned. The Tibetan Book of the Dead, the name Bliss uses (via subtitle) to describe this text, is a title assigned by an English anthropologist because the Egyptian Book of the Dead seemed similar at first glance. This subtitle, one that conjures images of pith helmets and the unconscientious anthropological approach of the 1920s rather than the more direct translation made later, is a conscious decision on the part of the production not just to refer to the translated text, but to reflect on the ways that a Western perception warps its meaning—one jarring, Freudian-sounding portion of the text is one example of this lens. Estella Dupree’s fascinating visual projections combine these two cultural visions, using patterned mandala-like assemblages of Western art to emphasize how the text has been processed and changed over time. Yet even this striking artwork is a reflection on the past, not a criticism—just another complementary philosophical aspect of this gentle performance. Perhaps this gentleness is where the production falls short. The struggle to come to terms with death is intended to be difficult at all stages. As Renee Migliaccio mentions in his director’s note, one “has to be ready for death,” or face panic. Amidst all the careful “dualities,” as described in the text—a scrim separating audience from performer, the performance itself carefully divided between a dancer and a speaker, the mirror-images frequently employed in the artwork—the personality of the struggling soul is lost. One does not feel invested in its progress, but is rather transported to a place where one feels nothing. It's a peaceful experience, certainly, but perhaps not an enlightening or personal one for the viewer. Bliss is directed by Rene Migliaccio. Text performed and adapted by Alessio Bordoni. Dance and Choreography by Charlotte Colmant. Butoh Dance Consultant is Eric Pettigrew and Choreographic Collaborator is Natasa Trifan. Artwork by Estella Dupree. Original Music by Amaury Groc. Lighting design by Cindy Shumsey. Assistant Director is Isabella Schiller. Technical Director is Joe Buckhart. Stage Manager is Suzi Bonnot. Audience Development by Colin Wait. Publicist is Michelle Tabnick. The cast is Alessio Bordoni and Charlotte Colmant.